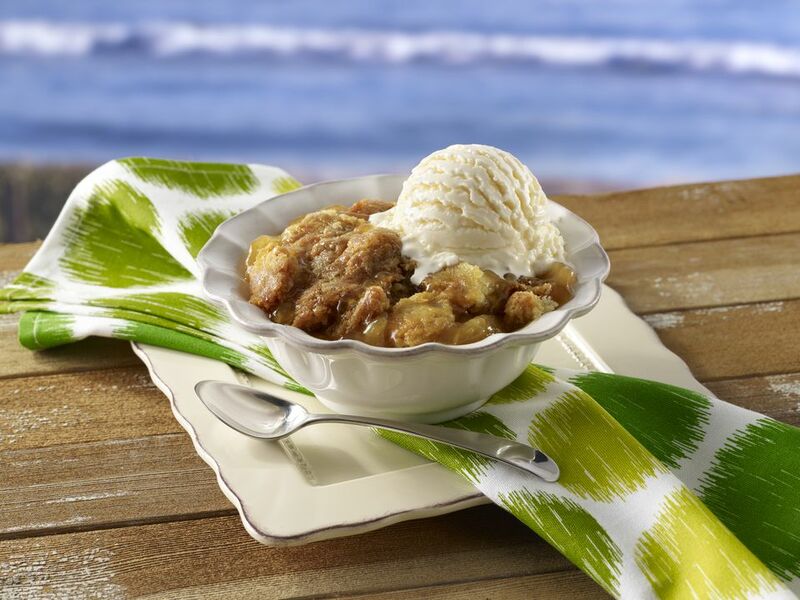 An apple pandowdy is usually made with pieces of pie dough as the topping. This version is a cobbler-like dessert made with biscuit mix, brown sugar, and spices. Serve it warm with ice cream or a drizzling of heavy cream. In a saucepan, combine 1/4 cup biscuit mix, brown sugar, 1/2 teaspoon salt, and vinegar and water. Remove from heat and add vanilla and butter. Set aside to cool. Place apples in a greased 8-inch square baking pan. Sprinkle apples evenly with cinnamon and nutmeg. Mix the remaining 1 1/2 cups biscuit mix with the light cream to make a soft dough. Drop over the sliced apples. Sprinkle with the granulated sugar and more cinnamon. Pour the cooled sauce over the top. Bake for about 35 to 45 minutes. Serve hot with cream or ice cream.